can. not. wait to see this brought back to life. those windows! that ceiling! gah! Have dreamed of seeing this brought back to life...yay! Looks like this is going to be an awesome restaurant venture by the same folks as NanaTaco! How exciting! The new windows are gorgeous! we almost stopped in the middle of Mangum to admire them! 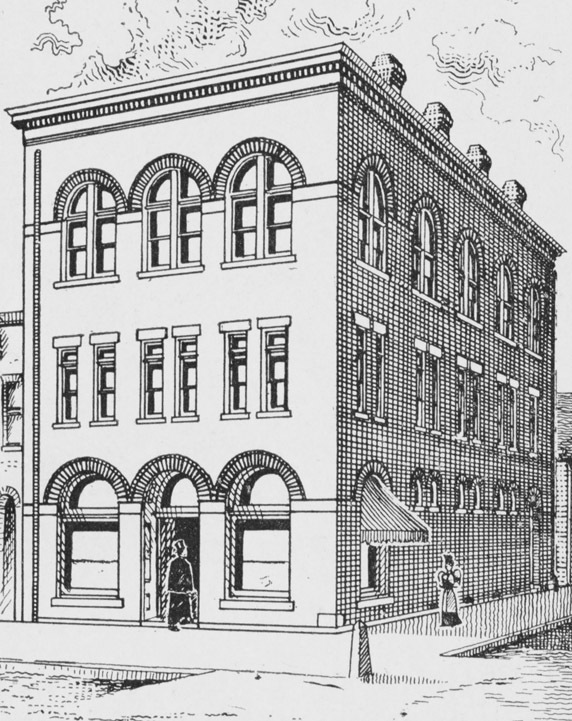 The Sneed-Thomas building was constructed on the southeast corner of East Main St. and South Mangum St. in the 1890s. It housed the Sneed and Thomas drugstore, operated by Paul C. Sneed and Allen S. Thomas. Their building was described in the "Handbook of Durham" as "a large three-story pressed brick building with marble trimmings." 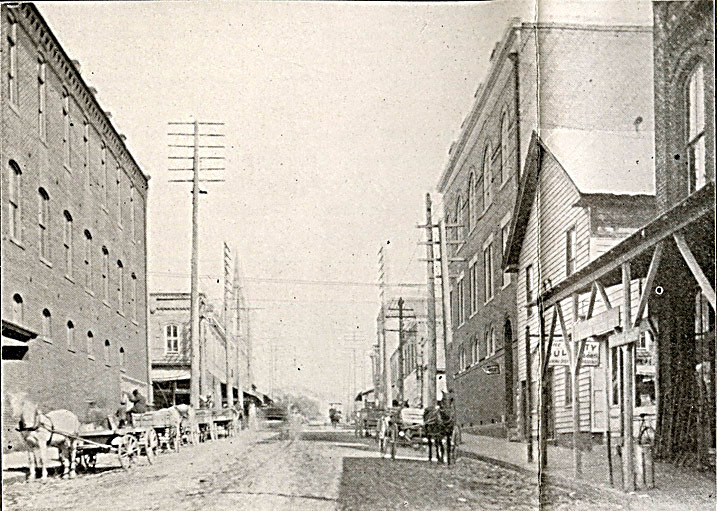 Looking north on South Mangum St. from near Peabody St., 1905 - the Sneed-Thomas building is on the right. This structure was torn down in 1911 for construction of a Neoclassical structure for the Citizens Bank, completed around 1915. The Citizens Bank was the outgrowth of the Morehead Banking Company which had reorganized after the death of Eugene Morehead in 1889, and reorganized again in 1905 with B.N. Duke as founding President of the new Citizens Bank. The bank moved to 105 East Main St. in 1905 before moving to its new building in 1915. Looking southeast, 1920s The historic inventory notes the resemblance to the old Fidelity Branch Bank in East Durham and surmises that the architect may have been the same. Below, a clearer view of the structure, looking southeast from Main St., 1930s. Note the beautiful arching, multi-paned windows along the Mangum St. side and a smaller one over the cartouche. 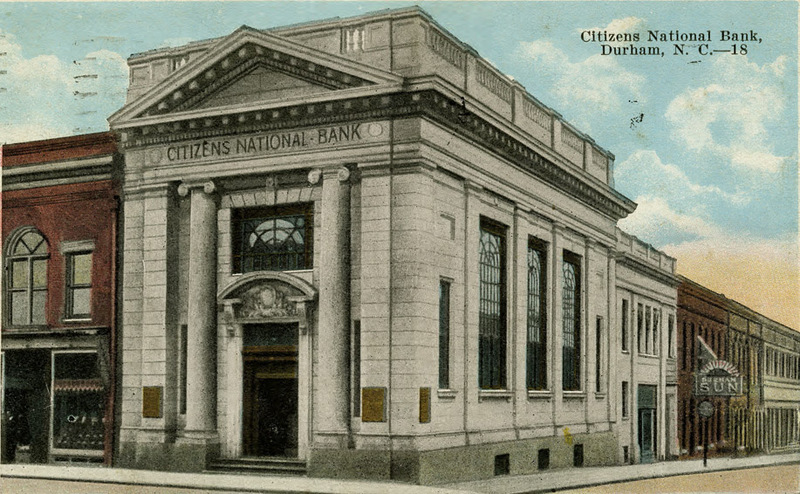 In 1961, the Citizens Bank merged with the Durham Bank and Trust and the University National Bank of Chapel Hill. 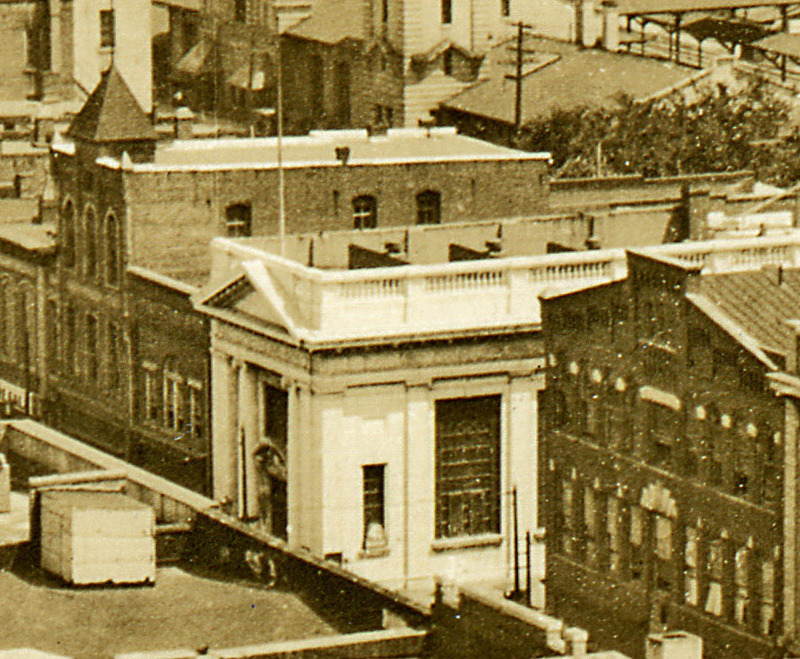 The new firm was called Central Carolina Bank (CCB) and was headquartered at the former Durham Bank and Trust building, the Hill Building. The former Citizens Bank building was converted to law offices in 1970, and referred to as the "K&M Building". This conversion, unfortunately, involved removal of all of the large windows and filling the openings with similar, but slightly different color stone. Citizens Bank, 1970s. Notice the filled window above the cartouche. It also divided the once full-height bank lobby into two stories of non-descript, windowless offices. I guess that this building is empty as of 2007, from the sign on the front. Seems like it could be very cool - something - particularly if someone were to put the windows back. Update 2012: the building was purchased at around the time of the entry above by a non-profit, which defaulted on its mortgage. The building was put back on the market as of July 2012, and was very quickly back under contract. The good news is that much of the original ceiling is intact above the bland dropped ceilings and wood paneling. Hopefully it will be re-exposed at some point. As of late 2013, the new owner (who purchased the building in late 2012) started the process of putting the windows back into the building, a very welcome sight. So very happy to see these replica-original windows back in - the building looks so much better! Nice job to Arthur Rogers, the developer. The new windows are gorgeous!